This is an original photograph taken on June 5, 1989, the day after the Tiananmen Massacre that occurred in Tiananmen Square, Beijing, in 1989. It is titled “Tank Man”. Jeff Widener of the Associated Press took this photograph, which is similar to four other versions. I originally searched “Tiananmen Massacre” in Google, and the cropped image came up. 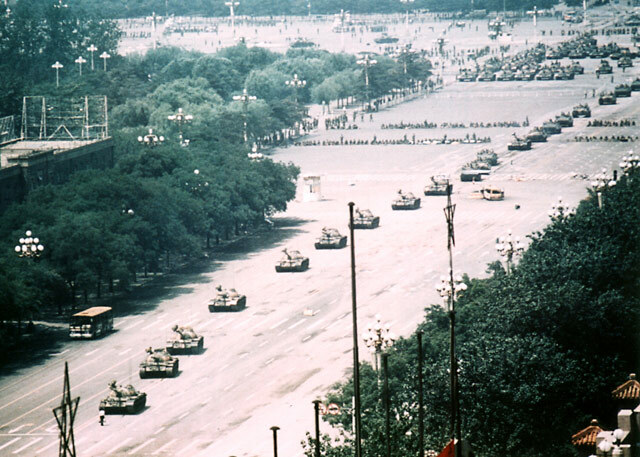 I looked for another image that was not as pixelated, and discovered that the original image is actually much larger, showing the brave man standing in front of a row of ten plus tanks, rather than just four in most images. 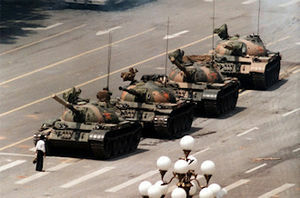 It was taken during the Tiananmen Square Protests of 1989, showing the students’ willingness to stand up against the Chinese Army for what they believed in. It is a clear image; we can see an unarmed man standing in front of the tanks that are forcing him to move. I chose this image because in my Freshman year of high school, my history teacher had this posted on his wall and I really had no idea what it was as a new history student. I researched more about the image, and discovered the poster was a photograph taken during the student led protests in Tiananmen Square in Beijing. It is now four years later, and in our history class we have been discussing many student led protests that took place in Berkeley around the 70’s and 80’s as well. The massacre began on June 3rd and lasted until June 4th, 1989 in the heart of Beijing, China, where many students and other demonstrators had been on strike for seven weeks. The photograph shows the People’s Liberation Army of China clearing out the unarmed protesters from the Tiananmen Square, killing hundreds of thousands of civilians in the process. This relates to Berkeley because unarmed protesters were killed and arrested for standing up against the government. This image is widely considered an iconic image of the 20th century that still marks an important day in history today.